If you haven’t heard by now, there was a complete implosion down in the Tampa Bay area. How is this relevant to DC? 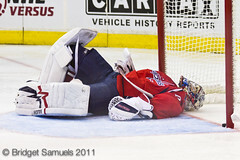 Because the implodees were our own Washington Capitals. The Caps dropped Game 4-and the series-with a lackluster, passion-less filled “do or die”contest to the Tampa Bay Lightning, 5-3. Our own Dan Rowinski will conduct a WeLoveDC postmortem tomorrow. Meanwhile, the gnashing of teeth, calling for heads, and fan deconstruction has already started. If you’re looking for answers to sooth the depressing rage, look no further than On Frozen Blog today and swing back here tomorrow for our own analysis.